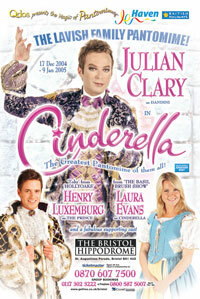 Cinderella- the most popular pantomime story owes its popularity to Perrault. Either Charles or Pierre Perrault retold this already ancient tale in “Histories ou Contes du temps passé”, published in Paris in 1697. There are many older versions of this “rags to riches” story –Scotland had a version called “Rashin Coatie”-after the garment of rushes a King’s daughter had to wear because of her three wicked step-sisters. In this version, as with many others, there is no fairy godmother- Rashin Coatie received her magic from a slaughtered calf- other versions , like “Ashenputtel” from the Grimm Brothers sees her with two step-sisters, and she is aided by a white bird, perched on a tree. In each case the heroine is able to meet her Prince through her kindness to others. In this story three children are abandoned in the wood, and are taken in by an Ogre. Two sisters live the grand life, and Finetta is forced to be their servant. In this tale she discovers a golden key in the ashes of the fire. This opens a chest filled with beautiful gowns, and again, she gets to meet her Prince in disguise. 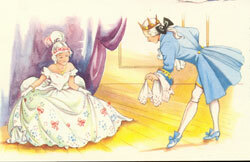 Even earlier was the Italian story of “La Gatta Cenerentola”- “The Hearth Cat” which dates from 1634. This is a much darker tale, with the heroine not so pure of heart- by her plotting to rid herself of her Step-mother events pass which see her faced with six step-sisters! This version actually has a fairy (living in a date tree) who grants her wishes. Possibly the oldest version exists in China, from a book written around 850-860AD. Yeh-hsien the heroine is kept in rags by her step mother. This time it is a magic fish- or the ghost of a magic fish that grants her desires. The version includes the loss of a slipper, and after a search for the owner, Yeh-hsien gets to marry the King. The Chinese story has nearly all the elements that occur in the later European versions. The slipper- in some versions made of silk, is often believed to be the result of a mis-translation of Perrault’s story- It has been mooted that he described the slipper as “Vair”- rabbit fur, rather than “verre”-Glass. However, it is likely that Perrault always intended the slipper to be made of glass- glass cannot be stretched, and by being made of glass, it could be seen to fit. The final proof must be that the Perrault title was “Cendrillon, ou la petit pantoufle de verre”. A gentleman- now a widower, married his second wife “The proudest and most haughty woman that ever was known”. She had two daughters who were exactly like her. The gentleman had a daughter by his former wife “but of unparalleled goodness and sweetness of temper”. After the wedding the Step-Mother began to display her ill humour. She could not bear the good qualities in her step-daughter, as it made her own daughters all the more hated and despised. The gentleman’s daughter was treated as a servant by these three, and lived in the top rooms of the house in a garret,on a bed of straw, while her own daughters lay in fine rooms, upon beds in the newest fashion. The poor girl bore all patiently, and dared not tell her Father, who was governed entirely by his wife. When she had finished her work, she would sit in the chimney corner, and sit down upon the cinders. Her cruel step-sister gave her the name “Cinderbreech”, but the youngest of her step-sisters, not as rude and uncivil as her sister called her “Cinderilla”. It happened that the King’s son gave a ball, and invited all persons of quality to it. The step-sisters were invited to it, and were very busy choosing out “such gowns, petticoats, and head-clothes as might become them best”. This was a new trouble for Cinderilla, as she had to iron, and pleat their ruffles. The Sisters talked of nothing but how they should be dressed. “For my part”, said the eldest “I’ll wear my red velvet suit, with French trimming. “And I”, said the youngest “will have my common petticoat: but then, to make amends for that, I’ll put on my gold flowered manteau, and my diamond stomacher”. Whilst Cinderilla attended to dressing their hair, her sisters taunted her about going to the ball. They declared that all the people would laugh to see a “Cinderbreech” at the ball. The sisters went two days without eating and even then “broke above a dozen laces in trying to be laced up close, so they might have a fine slender shape”. At last the happy day came, and the sisters went to court. Cinderilla “followed them with her eyes as long as she could, and, when she had lost sight of them, she fell a crying”. Her Godmother, seeing her in tears asked what was the matter. “I wish I could……I wish I could….”Her Godmother, who was a Fairy replied “Thou wishest thou could’st go to the ball?” “Yes”, said Cinderilla, with a great sob. Her Fairy Godmother gave her instructions- “Go into the garden, and bring me a pompion” -a pumpkin. Cinderilla brought her the finest she could get, not being able to imagine how this pompion could make her go to the ball. Her Godmother scooped out all the inside of it, leaving just the rind. She touched it with her wand, and the pumpkin was turned into a fine coach, “gilt all over with gold”. After that she looked in the mouse-trap, where she found six mice all alive. She ordered Cinderilla to lift up the little trap door, and turned each mouse into a fine horse- each one a beautiful mouse-coloured dapple grey. As she was at a loss for a coachman, a rat from a rat trap became the coachman with “the finest whiskers as ever were seen”. “Oh yes”, said she, “But must I go thither as I am, with these ugly nasty clothes?” Her Fairy Godmother touched her with her wand, and instantly her clothes were turned “into cloth of gold and silver, all beset with jewels”. After this she gave her a pair of Glass Slippers- the finest in the world. Her Godmother gave her one final command: She was not to stay at the ball beyond twelve o’clock at night. If she stayed one moment longer, her coach would be a pumpkin again, her horses mice, her footmen lizards, and her clothes would resume their old form. Cinderilla promised she would not fail to leave the ball before midnight, and then departed into the night. The King’s son was informed that a great Princess, whom no-one knew had arrived, and he ran out to receive her. He gave his hand as she alighted out of her coach, and led her into the hall. There was a great silence. Everyone left off dancing, “so attentive was everybody to contemplate the extraordinary beauties of this unknown person”. The Prince and Cinderilla danced. A fine meal was provided, during which the Prince ate nothing, he was taken up in looking at her. Cinderilla herself joined her two step-sisters, and gave them some of the oranges and lemons that the Prince had given her, which very much surprised them, for they did not know her. She heard the clock chime eleven and three quarters, upon which she made a curtsey to the company, and left the ball as fast as she could. As soon as she arrived home she thanked her Godmother, and told her how much she desired to go to the Ball the next evening, because she had enjoyed the Prince’s company. Shortly afterwards her step-sisters returned. Cinderilla pretended she had been awoken. “If thou had’st been at the ball” said one of her sisters “thou would’st not have been tired: there came thither the most beautiful Princess, she shewed us a thousand civilities, and gave us oranges and lemons”. Cinderilla seemed indifferent and asked the name of this Princess. They did not know. They told her that the Prince would give all the world to know who she was Cinderilla asked her sisters if she might borrow an everyday dress to go to the ball and see the Princess.. One sister, named Charlotte , refused. “Lend my clothes to such a Cinderbreech as you? Do you think me a fool?” Cinderilla was relieved she had been refused, “for she would be sadly put to it, if her sister had lent her her clothes”. The following day her sisters returned to the ball, as did Cinderilla- but this time dressed more richly than she was at first. The Prince remained at her side all night. Cinderilla forget the words of warning from her Fairy Godmother, and when she heard the clock strike twelve (she thought it was eleven) “she rose up and fled as nimbly as a deer”. The Prince followed her, but she fled, leaving behind one of her glass slippers, which the Prince took up very carefully. She arrived home without footmen, coach or finery, but one of her slippers remained in her possession. The Prince questioned his guards about the fleeing Princess, but they reported they had only seen a young woman “very badly dress’d, who had more the air of a poor country wench than a lady”. A few days later the King’s son caused it to be proclaimed that he would marry “her whose foot this slipper would just fit.” They began to try it upon the Princesses, the Duchesses and all the court in vain. It was brought to the two sisters “who did all they possibly could to thrust their foot into the slipper, but they could not effect it”. Cinderilla saw this, and, knowing the slipper, asked if she could try it on. The Sisters burst out laughing, and began to banter her. The gentleman who had brought the slipper looked earnestly at Cinderilla, and, finding her very handsome allowed her to try, as he had orders to let everyone do so. Cinderilla sat down, and placed her foot into the glass slipper. It fitted her “as if it had been made of wax”. Her Sisters were astonished, but were more so when she produced the other slipper from her pocket. Upon this, her Fairy Godmother came in, touched her with her wand, and Cinderillas clothes became more rich and magnificent than they ever were before. The sisters, realising it had been Cinderilla at the ball, threw themselves at her feet, to beg pardon for all the ill treatment they had made her undergo. She raised them up, and told them that she forgave them with all her heart, and desired them always to love her. She was conducted to the Prince, dressed in her finery, and a few days later he married her. Cinderilla, who was as good as she was handsome, gave her sisters lodgings in the Palace, and married them the same day to two great lords of the court. 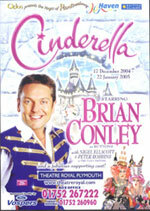 The Pantomime “Cinderella” takes place in the home of the Baron, Cinderella’s Father, and at the Royal Palace. In the Pantomime the opening scene usually takes place outside the Baron’s hall- usually called “Hardup Hall”, or sometimes “Stoneybroke Hall”. In many productions there is a prologue, set in Fairyland. Here the Fairy Godmother will set the scene for the story, without giving away too much of the plot! The Opening scene often has the Baron- Baron Hardup, or Stoneybroke returning home. He informs the villagers and his daughter that he has got married to a woman with two daughters. They will be arriving shortly. The part of The Baroness is not used very much in recent times, although there are still a few productions that retain her character. Where she does not appear the Baron will tell the assembled crowd that she has sent her two daughters in advance “to see if they like it”. Often he is engaged to be married, and that way the complication of seeing no Baroness can be avoided. Cinderella (rather puzzlingly) is usually discovered in her rags at the beginning of the pantomime- even before her sisters have arrived and made her their servant. Quite often they have already been installed for a while, which solves the “rags” problem, and in some versions they tear her dress on an early entrance, and reduce her to wearing rags. The “Ugly” Sisters make their entrance, and having proved some comedy- bickering amongst themselves as to who is the more beautiful, they will shortly meet Cinderella and bully her- exiting to loud “boos” from the audience. The Prince arrives, usually in the village, along with his valet, Dandini. The Prince complains that he is never allowed to meet “ordinary girls”, and he tires of life in the stuffy Palace. A plot is hatched between the two that they will “swap places”. The Prince- despite never changing his clothes, is to be the valet, and Dandini will enjoy himself pretending to be the Prince. This plot allows the Prince more freedom- it will help him to meet Cinderella later without her being cowed by his Royal Title. 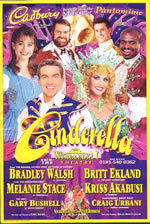 The plot continues when, having met Cinderella (usually in the woods) the Prince loses her. He doesn’t even know her name. Dandini suggests that the Prince announces that there will be a Grand Ball.- and that every lady in the realm is invited. That way he is bound to see her again. They retire to organise the ball and to issue the all important invitations. 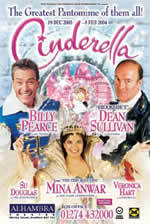 Cinderella is a moral pantomime- to achieve the wonderful things that are granted to her, Cinderella must face some sort of test to prove she is worthy. Although being bullied, and treated like a servant would count, there is usually a further test she must take to prove worthiness. This generally happens in “The old lady in the woods” scene. Here, the Fairy Godmother disguises herself as an old lady, and stumbles across Cinderella in the woods. 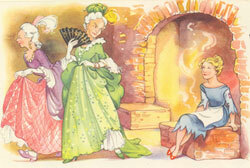 Cinderella helps the old lady, and gives her her own bundle of firewood before setting her on the right path. The old lady tells her that her goodness will be rewarded. Up until recently most Cinderella pantomimes had a hunting scene. This took place in the woods, and often involved the Prince and Dandini, the huntsmen and women, and often juveniles dressed as animals. Over the years the emphasis has gone from a simple hunting scene to one in which the fox outwits the hunters, and Cinderella often has a political comment when she asks the Prince (in disguise as Dandini) “Why do they hunt the poor animals? I think it’s cruel”. The Prince often replies that he will have it stopped immediately if it distresses her. Things are so much simpler to sort out in pantoland! Over the past few years several pantomimes have dropped the hunting theme altogether, or just have a cursory glimpse of a few hunters dancing to utilise costumes already in stock. 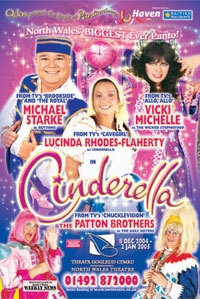 The days of seeing dancers dressed in “hunting pinks” are definitely on the way out in “Cinderella”. The plot that has almost vanished in recent years (possibly because of economy) is the poverty plot. The Baron has no money, and traditionally would be forever pursued by The Brokers Men- two characters that would also be available to take part in “three hander” money gags with the Baron, or Buttons. Often nowadays there are no Broker’s men, and in some versions the Broker’s MAN can be found with his side-kick as a puppet- it is the ideal role for the ventriloquist speciality act. In Act one you might find a “Boudoir” scene, involving the Ugly Sisters getting ready for the ball. Quite often now it can be found in Act Two- the problem with Cinderella being that is has a long first half, and a shorter Act Two. The last part of Act One involves the issuing of the invitations. Usually delivered by the Prince-in his persona as Valet- he issues tickets for the Baron and his THREE daughters. Buttons is usually chosen to give Cinderella her ticket, usually when she is at her lowest ebb, scrubbing the kitchen floor at the command of her Ugly step-sisters. Her joy is short lived. The Sisters discover she too has been invited to the ball, and in a scene that should be bereft of comedy, they are at their most cruel. Her ticket is torn up, and they depart for the ball leaving Cinderella a sobbing figure on the kitchen floor. Traditionally this is the moment when Buttons will enter and attempt to cheer her up. The scene can involve traditional “business”- he declares they can have their own ball, right there in the kitchen. He can dress her in a tablecloth for a gown, a colander as a tiara, and provide her with a “16 Carrot necklace”. Another traditional piece of business here, not seen so often today was the “Eating the apple” business, where Buttons claims he will share his apple with Cinderella, and watches it get completely consumed. Sometimes this is the place for a song and dance between Buttons and Cinders, but ultimately he fails to cheer her up, and, like Greta Garbo, she desires to be left alone. The knocking on the door is the cue for the entrance of the Fairy Godmother. She often enters as a cloaked figure and transforms into a glittering Fairy Queen, and in recent years often provides light comedy in the role: she can be “scatty” sometimes “bossy”, but she is always in command. Recently this role has been open to a novel change. It is no longer solely the role that can only be played by an actress. Men have taken the role on a few occasions. Dame Hilda Brackett (Patrick Fyffe) was a remarkable Fairy Godmother- although it has to be admitted that the character of Dame Hilda was a truly real creation, and Patrick played Fairy Godmother as Dame Hilda playing the role. 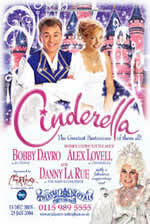 Recently Danny La Rue has played the part, and in Edinburgh Alan Stewart will be creating it at the King’s Theatre. The Fairy Godmother asks Cinderella for the pumpkin and the mice- it is not often that she requests lizards as footmen these days- with the reduction of chorus dancers since Victorian times it would be stretching limits to provide companion fairies and lizards! Another difference from the Victorian versions is the transformation. 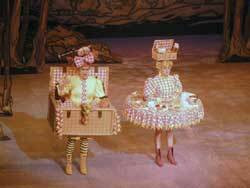 In an era when pantomimes could last for four hours or so, and the stage was filled with flying ballets and a chorus of forty, the transformation would be slow. Each different scene would be revealed, ending in a tableaux. Often the four seasons would appear before the final transformation and the coach appeared. Today we would generally transform from the kitchen into a scene that allows room for the coach and hopefully four or six white Shetland ponies. Before this, the Cinderella transformation takes place when, during a brief dance sequence, she changes costume and appears in her finery. Recently it has been the fashion for Cinderella to chose Buttons as her Coachman, and the tabs fall as they set off for the ball. Act Two traditionally used to open with a scene called “The Palace Gates”. In this frontcloth scene various characters would arrive for the ball, and some would be rejected. The Sisters often had a struggle to be admitted despite having tickets. In recent times the “Palace gates” scene has all but vanished. It is more usual now to open act two with the ballroom scene.- usually the most lavish scenery in the show, constructed during the interval. This scene would involve the chorus in ballgowns, often a Major Domo, and is often the place for Dandini to have a solo “spot” or song. 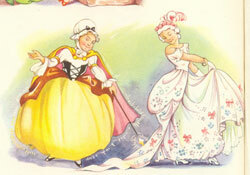 The Baron arrives at the ball, followed by the two Ugly Sisters. When the Prince and Dandini exchanged identities the “Sisters” both made a play for Dandini, believing him to be the Prince, and either ignoring, or being rude to the actual prince. Shortly after they arrive at the ball the Real Prince is announced, and they realise their terrible mistake. 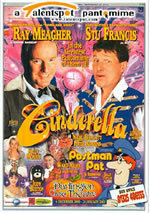 They do not recognise Cinderella as the mysterious Princess at the ball however. Cinderella, disguised as a Princess arrives at the ball. In some versions the Prince does not recognise her as the girl he met in the woods, and in some versions he does. Either way it is essential that he never knew her name when they met, or else the plot would be sunk! On occasion the Fairy Godmother makes an appearance at the ball, and sometimes Buttons. The Ball scene is often divided into two. The Prince and Princess glide off into an ante room, and often the “Cabaret” or “Star turn” happens in the ballroom. 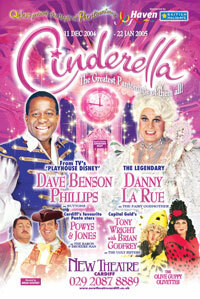 Following this the dancers return, Cinderella and her Prince dance and the clock begins to chime midnight. Cinderella rushes from the ball, and the slipper is found. The Prince vows that he will not stop searching until he has found the girl who’s foot fits the crystal slipper. 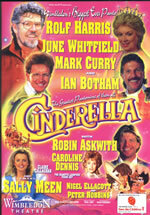 The following scenes are often to be found in the pantomime “Cinderella”. 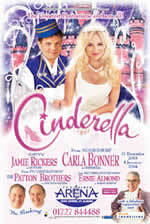 There might be a scene where Cinderella tells Buttons about her night at the ball, during which he discovers that his love for Cinderella is definitely unrequited. The Sisters will often have a boudoir scene in Act Two, if there has not been space and time for one in Act One. This can involve slapstick, or a comedy strip, and sometimes it can involve a “ghost Gag”, often with the Baron or Buttons in attendance. 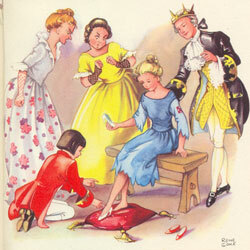 The final scene in “Cinderella” is “The Slipper Fitting”. Dandini and The Prince arrive to fit the slipper. Often the sisters have contrived to get rid of Cinderella while the fitting takes place. In many cases she has already revealed to them the fact that she has the second slipper. The two sisters both struggle to fit the slipper- traditionally this scene involves one sister with a very long stocking that is pulled off, and the other often has a dummy leg hidden beneath “her” costume in a vain attempt to win the Prince’s hand. 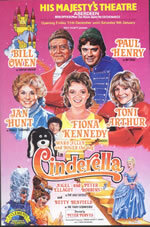 Their best comic efforts fail, and Cinderella is discovered- often through the magic of the Fairy Godmother. She tries on the slipper- it fits! The sisters get their come-uppance, or in some cases, very true to Perrault’s version, they are forgiven, and exit with two gentlemen! The Prince asks the Baron for his daughter’s hand in marriage, there is a brief love duet reprise, and the scene ends. Traditionally this is followed by the songsheet, often led by Buttons, and then the final scene, as in all pantomimes is the Finale or “Walk-down”. 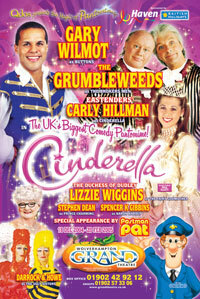 Cinderella the pantomime has had many influences, over hundreds of years to draw on for it’s characters. The First “Pantomime”- but not as we would recognise it today was “A New Grand Allegorical Pantomime Spectacle” at Drury Lane in 1804. 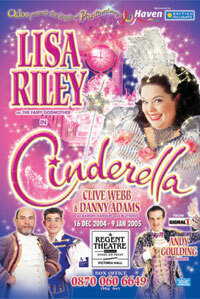 In 1809 the pantomime was repeated at the Lyceum Theatre. The only recognisable elements we would see would be that the Sisters were served by a servant called “Pedro”. (Played by Joseph Grimaldi). There was no Baron, Baroness, no valet and the magical arts were supplied by “Venus”. 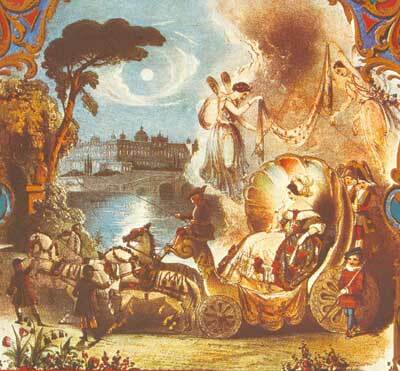 The more important influence was an Opera- “La Cenerentola” by Rossini. 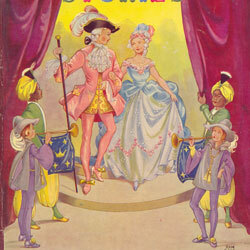 It premiered in London in 1820, and within a few months the Pantomime version had taken elements of the opera on board. The Sisters in the Opera were named Clorinda & Thisbe, “Cenerentola” herself was named “Angela”, Her Father was Baron MonteFiascone, Don Ramiro was the Prince of Solerno, and DANDINI was his valet! 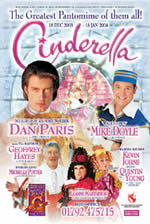 Of all the named characters to remain to this day, Dandini would seem to be the only one we would recognise. 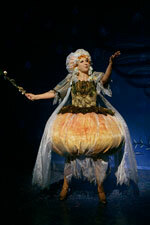 The Opera had a Baron, and a Dandini, but it still lacked A Fairy Godmother and, of course, Buttons. In 1820 “Harlequin and Cinderella” was the Covent Garden Easter Pantomime- although entangled with the harlequinade, it had a story, unlike it’s predeccessors. The Principal girl was called “Finetta”, Joseph Grimaldi played the Baroness, it had a Baron Pomposino, A Dandini and a Prince Aledore. There was no Fairy Godmother still. In later Operatic versions (1830) the sisters were frequently still Clorinda and Thisbe, the Baron was now Pumpolino, and a Fairy-Queen character in this comic opera provided the magic. Pedro the servant was retained, and the Prince was named Felix. 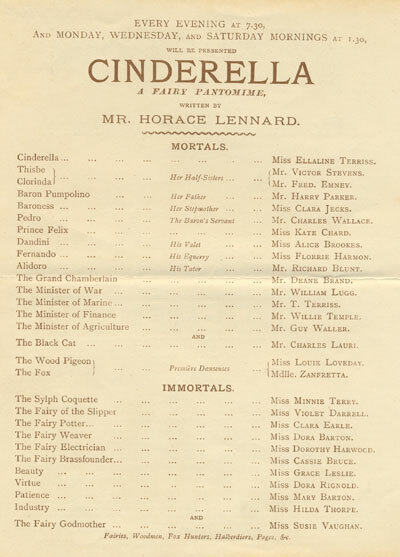 Many versions followed during the period 1830-1860 when, at the Royal Strand Theatre in 1860“A Fairy Burlesque Extravaganza” was presented entitled “Cinderella! Or the lover, the lackey, and the little glass slipper” In this version the playing of the Ugly Sister by a man was of significance. Still not our pantomime, but well on the way! This version had Baron Balderdash, Prince Poppetti, Clorinda and Thisbe, and most importantly..the page was called BUTTONI. Played by Mr H.J. Turner. “Buttons” was in his infancy. However- Dandini was facing a crisis- his name (and he was the first that we recognise today) kept changing- the Victorians called him “Flunkini”, “Chappini” and “Masherino”- all burlesque names (A “Masher” to the Victorians was a “Swell” about town) “Popinjay” and Sprightly”. 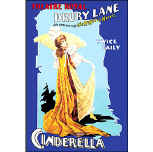 Often the Prince exchanging places with Dandini was omitted from the plot.In 1905 Harry Fragson (a rare male “boy” for those times, when Dandini would usually be played by a Lady) was called “Dandigny at Drury Lane. Sometimes he became Count Dandini as well. We all think of Cinderella’s Prince as “Prince Charming” today. 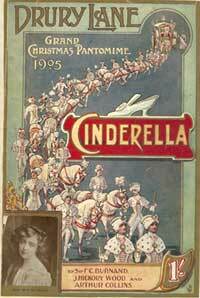 In fact that name was not used in Central London Pantomimes before the London Palladium Pantomime of 1915. The part of “Prince Charming” was played by Nora Delaney. He had been called “Prince Charming” in Wakefield in 1880, and again at Walthamstow in 1898. Prior to that he had been Ramiro, Aledore, Floribel, Cheramour, Prettypet, Lollipoppet, Sapphire, Primrose, Jaspar, Rupert, Evergreen, Rudolph, Glorio, Paramount, Splendid and Prince Paragon, amongst others throught the 1880’s and ‘90’s. 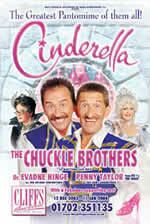 In 1904 at Liverpool both the names Prince Charming and Buttons appear together. Possibly for the very first time, but Prince Charming as a name was not set in stone, and it changed many times after that. In 1912 Bradford had a “Prince Charming” and at the Palladium in 1915. 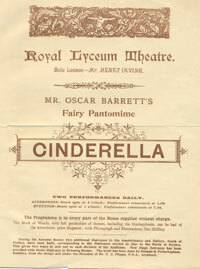 A few years later “Charming” was to found in several provincial pantomimes, but even then he was “Paragon” in 1918 at the Lyceum, and Prince of Floravia” at Covent Garden in 1920! 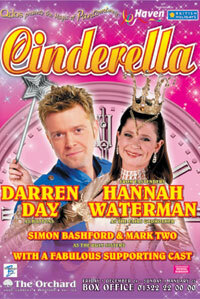 The heroine of the pantomime today is always called “Cinderella”, and sometimes “Cinders”. In her early beginnings in pantomime the plot recalled that “Cinderella” is actually a nickname given to her by her cruel step-sisters. In the Opera she was called “Angela” and has been “Angelina” (of the Angels- to reflect her kind nature), and she has been “Finetta”- and “Fioretta” “afterwards “Cinderella the Baron’s daughter”. There has been the version where her name was simply “Ella”, and the Sisters added “Cinder” to her name as they mocked her (Lyric Hammersmith) for lying among the cinders of the fire. As mentioned previously, the Fairy Godmother has been known as Aledore, has been portrayed as “Venus” bestowing her gifts, and over the years has had other names- Fairy Crystal, Fairy Goodheart, Fairy Kindheart and Claribel amongst others. Most often in pantomime today she is simply “The Fairy Godmother”, and seems to have lost her first name somewhere along the line. He has been MonteFiasconi, Baron Balderdash, Pumpolino, Baron De Broke and Baron Lacklands, as well as Baron Backscratcher. (Sadlers Wells). In addition he has been called Baron Huffenduffendort (1860) Baron Bluster (1872) Baron Blunderboar (Covent Garden 1875) as well as Baron Pumpernickle of Groswig (Drury Lane 1878), Baron Filletoville – think about it..got it? (Drury Lane 1883) Boosey De Blackfriars, De Bluff, Baron de No Cash (not so subtle- Lyceum 1910 & 1918) Baron Beauxchamps (Drury Lane 1919 and even Baron de Boeuf! My personal favourite was when Julian Wylie named Dan Leno Jnr’s part, “Baron Mumm” at Drury Lane 1931. 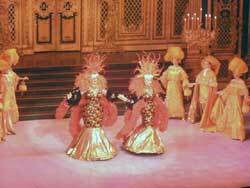 Wylie had booked Ethel Revnell and Gracie West as the Ugly Sisters. Their variety act was billed “The long and the short of it”- Revnell towering at 6’ over the diminutive West at barely 5’. They were the step-daughters of Baron Mumm and were therefore called Maxie Mumm and Minnie Mumm.! Eventually the Baron seemed to settle on the titles of Baron De Broke, Baron Stoneybroke, and Baron Hardup. Of these Hardup and Stoneybroke remain the favourites throughout the country today. Quite simply, the Baroness usually has the same name as the Baron. Whatever his title is (as we are rarely told his Christian name) she follows suit.There have been a few exceptions-especially when The Baroness is merely engaged to the Baron. When Danny La Rue played Baroness at Southampton the title borne was “Baroness Voluptua”. Liverpool Everyman recently had “Baron Basil Bootles and Baroness Pandora Bootles”. At Billingham last year Helen Fraser (from “Bad Girls”) played Baroness Bodybag! Most often, when the Baroness appears she would be Baroness Hardup. When the plot of “Cinderella” made the Baron a man with grave financial difficulties, the part of two Broker’s Men- bailiffs were introduced. Usually to “distrain his goods and chattels”, and to pursue him throughout the pantomime for money. This lent itself to employing “double acts” in the show, with opportunities for “three hander” gags and knockabout. The Broker’s men have often been a triple act, and in some cases as many as five! They also represented the law (like the Chinese policemen in “Aladdin”) and is flouting them, the tradition dates back to Grimaldi and the Harlequinades. Hope & Keen used their own names at the Palladium appearing as “Mike & Albie” .Cliff Richard had his group “The Shadows” as three Broker’s men at the Palladium when he played Buttons. They began life as Clorinda and Thisbe. 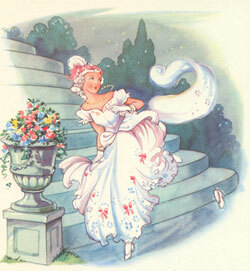 The only named Sister in the original Perrault fairy tale was Charlotte. 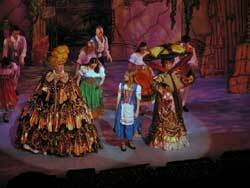 Today the Ugly Sisters are played by men- Although you will still find exceptions to that rule. In earlier times the roles were played by women, possibly as a direct result of the Opera “La Cenerentolla” and the fact that the Baroness could be played by a comic man, and the Sisters by actresses. Today you may still find the eldest played by a man, and the youngest by a woman, or by two women. Still following the plot? They remained Clorinda and Thisbe for a while, then their names were forever to be changed on a regular basis. In 1841 the eldest was called “Blowsabella, and was played by a man- Jefferini at Sadlers Wells, and the youngest by an actress! When Terry Scott and Julian Orchard played “Sister” at the Palladium, their names were “Theresa & Julia”. Brian Murphy and Yootha Joyce played “Sister” there and, of course, were “Georgina & Mildred”! When Elsie & Doris Waters played Sisters at Leeds (1939) they were named after their Radio characters- “Gert & Daisy”- and as real Sisters playing Sisters, they reflect the Patton Brothers today- real brothers playing Sisters! Sharon & Tracie (Essex Girls!) before moving on to the “pop” scene- “Whitney & Britney”, “Kylie and someone I’ve forgotten!”, “Sporty & Posh” , “Sporty and Scary” (Spice Girls Era), Jordan & Jodie and I think we’ll be “Trinny & Susannah” in our next incarnation! Little wonder that we personally NEVER refer to each other by character name on stage, preferring to call each other “dear”- the brain just doesn’t work that fast! Like their costumes, the Ugly Sister’s names will always echo and mimic the times we live in right now! When Mr Turned played “Buttoni” in 1860, at the Royal Strand Theatre, you might expect to see the name “Buttons” appearing shortly afterwards. This did not happen. Beginning his life as “Pedro”, he remained “Pedro”, not Buttoni at Covent Garden in 1864, then Kobold at Drury Lane (1878) Dozy at the Pavilion Whitechape (1882) and Hobbedyhoy at Drury Lane in 1883. The part was not similar to the one we think of today. Buttons emerged from the provinces. “Puffpaste”, “Podgio” “Jack Pickles” “Pickles”, or “Peter” were cheeky young house servants in various productions. Once he appeared as “Billy Buttons”, and was often played by a male juvenile. Young Billy Buttons was at Birmingham in 1898, and at Newcastle a year later he was called “Tickleum”. Older actors rescued the role from the Juvenile, and by 1897 Pedro was “A severely put-upon lackey”. In 1905 his character- called Alphonso professes true love for Cinderella, and in 1910 he was called “Buttons” at the Lyceum Theatre London. By 1918 at the Lyceum, Buttons had graduated to a love scene in the kitchen with Cinderella, but the character vanished from Drury Lane in 1919, and was a servant called Walter in 1920 at Covent Garden. His name and his now traditional costume- either Blue or Red with many shiny buttons is in the style of a Bellboy, Bell-hop” or “Bus-boy”. “Buttons” had been a late Victorian slang word for an under servant. Even by 1921 his name was not set in stone- like Prince Charming he had a struggle to hold on to it. 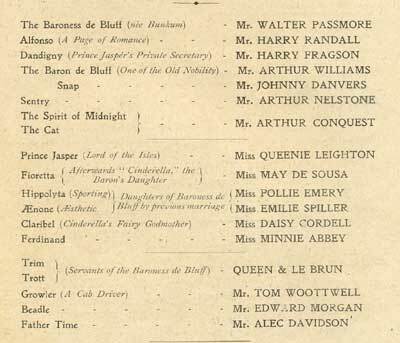 The Pantomime at the Lyceum in 1921 probably set the seal on his name. His Kitchen scene where he has a “pretend” ball with Cinderella probably had it’s origins in the Empire Ballet of 1906. There was no Buttons in the ballet, but the legendary Adeline Genee performed a dance where “Up she jumps, plucks a couple of feathers from her broom and sticks them in her hair, snatches up the tablecloth to make a train, and whirls around her broom as an imaginary partner”- this type of business, dating back to Commedia dell’arte is the same as you would see today. These items are available as Free Downloads from www.britishpathe.com - if you wish to purchase higher resolution copies, you can buy them from the British Pathe site. All of the items will open in Windows Media Player. All material on this page remains the property and copyright of British Pathe Limited and is used on this site with permission and are preview copies only.